Because I’m traveling at the end of the week, this year’s Thanksgiving “feast” at my house will be frozen pizza and beer and whatever looks good when I’m wandering the aisles at the grocery. 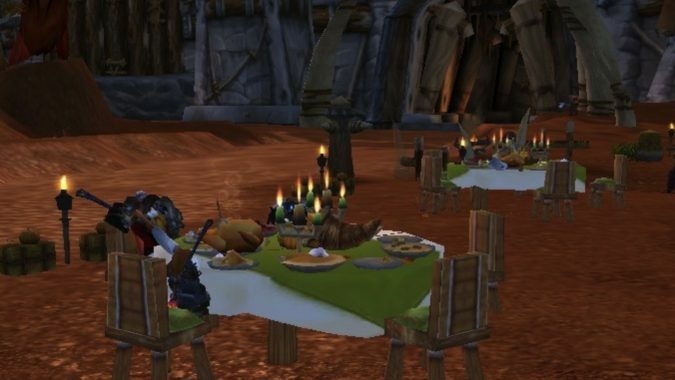 But Blizzard’s homage to the US Thanksgiving holiday has arrived and, well, it’s probably another holiday you’re ignoring. Just like last year, there’s nothing new. You’ll find tables outside all major capital cities and all minor towns with innkeepers. Two neutral locations — Light’s Hope Chapel in Eastern Plaguelands and Ruins of Thaurissan in Burning Steppes — have tables. Sitting at them gives you an opportunity to do holiday specific achievements such as my favorite: Food Fight. My inner 5-year-old remembers the fight with peas at Grandpa’s and how he laughed while my parents were mortified. But if you haven’t done it before — or haven’t collected all the goodies — there are a few activities to consider. It stacks with the 14% reputation buff from WoW’s 14th anniversary, which makes it the perfect time to farm reputation with any faction. So make note of where the nearest table — unfortunately, there are none in Battle for Azeroth zones, so you’ll want to make a trip back to the mainland to pick it up — and remember to use your anniversary item for a buff before you start your reputation grind. If you’re into transmog, the Pilgrim’s Bounty clothing is quite nice. But unfortunately, with the exception of the Pilgrim’s Hat, it can’t be transmogged outside of the holiday. 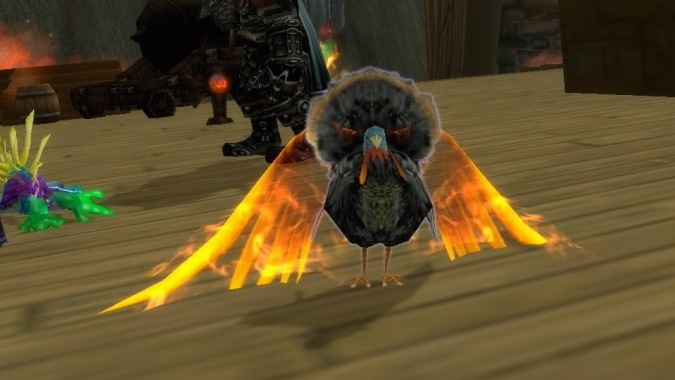 There are two battle pets — Plump Turkey and Frightened Bush Chicken — to snag if you don’t have them already. The turkey comes from completing all the quests to obtain the Pilgrim achievement while the chicken comes from bag you get after doing daily quests. Once you get the turkey, put down a basic campfire, summon your turkey and watch the result. Finally, one of my favorite toys is available during Pilgrim’s Bounty: the Silver-Plated Turkey Shooter, which has proven itself to be very reliable in guild events. There is nothing more sinister — or silly — than a bunch of guild members — all turkified — riding down a road. …but it’s still not our favorite holiday. So are you going to do anything with Pilgrim’s Bounty? Is the Silver-Plated Turkey Shooter a better toy than the Headless Horseman’s Hearthstone, which I declared earlier this month was the best toy? Is there a way to make this holiday better? We need a 5-man, don’t you think? Will your holiday menu include the same items from the bountiful table? Maybe next year we’ll see those holidays have something different. I can dream, can’t I?